At your bankruptcy hearing, the actual time you are in front of the trustee answering questions is usually one to three minutes. The trustees usually schedule six to seven hearings each half-hour. Some trustees will have everyone in the room stand up and swear them all in at the same time. 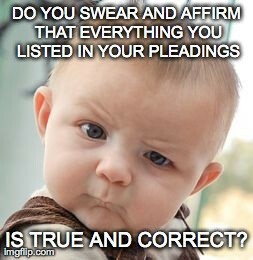 Once you are sworn in under oath, the trustee will question you. The following is a general list of questions the trustee will more than likely ask you. Is your address the same as the address listed on the Petition? Did you examine the Petition and Schedules? Are the Schedules you filed with the Bankruptcy Court true and accurate? Did you list all of your assets and all of your debts? Have you received a copy of theNotice to Consumer Debtors under 342(b) of the United States Bankruptcy Code? Do you owe anyone for alimony or child support? Have you entered into a written contract with your attorney? Have you lived in this state for the last 2 years? Have you transferred any property into a trust in the last 10 years? You know that if you inherit any money or become entitled to any life insurance proceeds in the next 6 months you will have to turn this money over to the Trustee, correct? Are you current on your tax return filings? Have you recently received a tax refund? If yes, how did you spend the money? If no, do you anticipate you will receive one within the next 6 months? Do you still own the property that you listed in your schedules? How did you come up with the values you listed for your property? How did you encounter your financial problems? If you are filing jointly with your spouse, only one of you will answer these questions. Once the trustee has finished questioning the first spouse, the trustee will typically ask the other spouse “If I were to ask you the same questions I just asked your spouse, would your answers be the same?” It is a good idea to decide which spouse will be responsible for answering the questions ahead of time, just so you are prepared. Please keep in mind that the trustee can ask you any of the above questions, none of them or anything with respect to your property, assets, income and/or financial situation as a whole. Having said that, these are generally the questions the trustee asks.